This walk: 2013-3-13. Mardon Down, wild daffodils, Haytor, Giant's Grave, cairns, largest stone circle on Dartmoor, Haldon Belvedere, frozen puddles, cutting, growan, Maximajor Stone or Headless Cross, pillared circle. Link to Google Satellite view of the area - the car park can be seen on the north side of the road, about 1/3rd the way up the image and 1/4 the way in from the left edge. 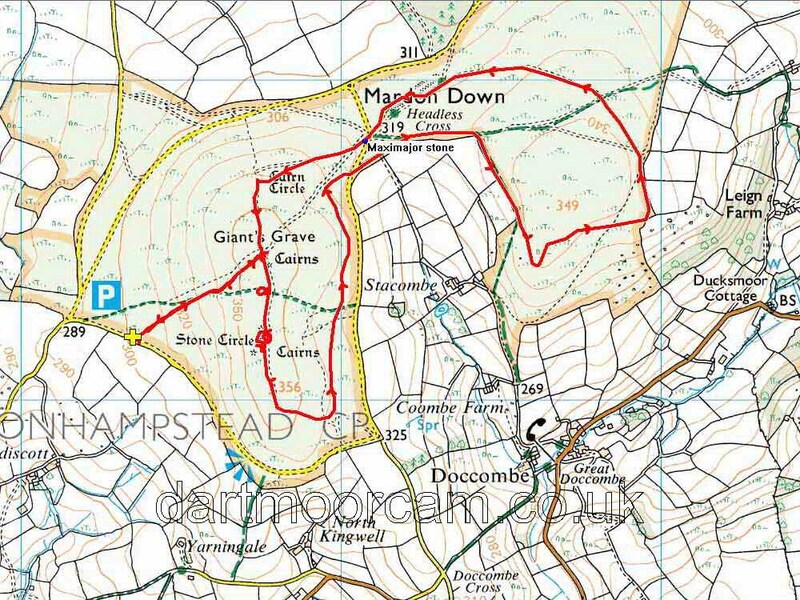 Mardon Down consists of two areas of Common lane joined by an isthmus. There is a short ridge at 355 m (1164 ft) elevation. Zoomed view to Haytor, almost due south, 10.2 km (6.34 miles) distant. The first of two neighbouring cairns, this largest being the Giant's Grave, the final resting place of the local giant, Maximajor, who was reputed to cure sick livestock for a price. He is said to have risen from the dead some time later and was turned to stone for his trouble (more below ....). Image © J Butler 1997. Reproduced by kind permission (ref. 29 Sept. 2012). 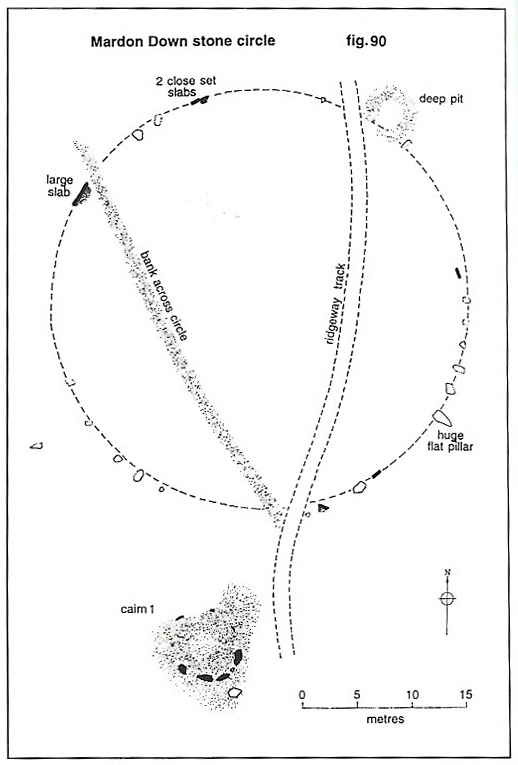 J. Butler (1997), Dartmoor Atlas of Antiquities Vol. 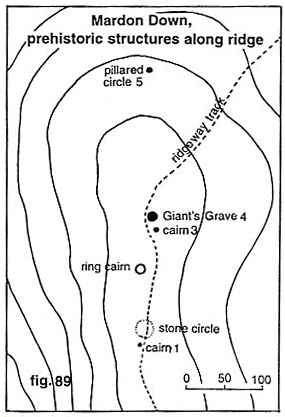 5, The Second Millenium BC, Mardon Down Stone Circle and Cairns, page 147. Remains of frozen puddles around the cairn. Panoarama of the circle ..... Click on the image to see a larger version. GPS track (red) made by walking around the outer edge of the Giant's Grave cairn (above) and the stone circle (below). Another view, with part of the circle in the background. Haldon Belvedere, also known as Lawrence Castle, 10.7 km (6.65 miles) east. Click here for Google Earth view. An Occasional tree ..... you look it up! Frozen puddle, 4 of 4. Bronze Age beef burger? Close to SX 77720 87511. Zoomed view of the cutting 'cliff'. The Maximajor Stone - "That'll learn him". Alternatively, The Headless Cross, located at SX 77076 87810. Another view of the pillared circle. This walk was reached by parking at the quite large car park at SX 76350 87198 marked by the yellow cross on the map above. 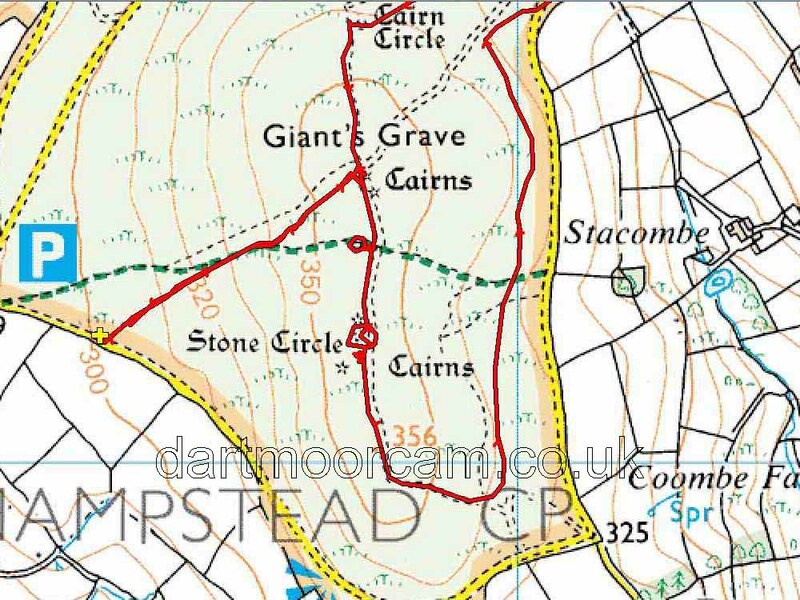 For those using satnav devices that take Lat/Long entries, it is at 50�40'16.6"N, 3�45'04.3"W. I can't give detailed directions other than to enter Moretonhampstead and leave by the 'yellow' road going out in a generally north-east direction. This is the road to Clifford Bridge/Clifford Cross/Clifford Farm/Clifford Barton, the opposite side of Mardon Down: the road is narrow! Google Street View showing the centre of Moretonhampstead when entering from the west, either (1a) turn left at this point or (2a) the next left around this block; then either (1b) diagonally right across the road and then immediately left or (2b) turn right and then immediately left, both into Lime Street. Distance - 6.26 km / 3.89 miles.